← the five most dangerous types of leaders. 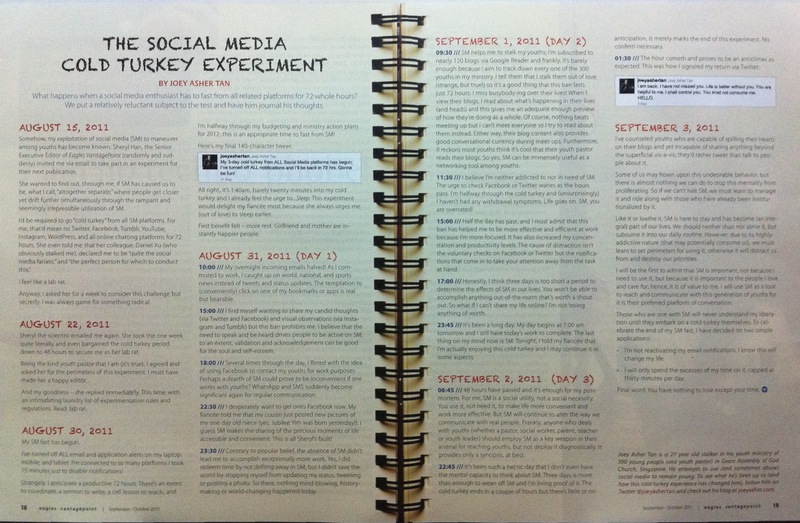 the social media cold turkey experiment. Last month, an article I wrote was published on Eagles VantagePoint, a website and magazine which I highly recommend as it provides a fresh perspective on contemporary topics. (The first article I wrote for them was on Marketplace Evangelism.) For my second assignment, the editor of the magazine challenged me to fast from all social media platforms for 72 whole hours and to journal my experience along the way. Of course, I took up the challenge. Come on, how could JAT pass up on something as fun as that!? Somehow, my exploitation of social media (SM) to maneuver among youths has become known; Sheryl Han, the Senior Executive Editor of Eagles VantagePoint (randomly and suddenly) invited me via email to take part in an experiment for their next publication. She wanted to find out, through me, if SM has caused us to be, what I call, “altogether separate,” where people get closer yet drift further simultaneously through the rampant and seemingly irrepressible utilization of SM. I feel like a lab rat. Anyway, I asked her for a week to consider this challenge but secretly, I was always game for something radical. Sheryl the scientist emailed me again. She took the one week quite literally and even bargained the cold turkey period down to 48 hours to secure me as her lab rat. And my goodness – she replied immediately. This time, with an intimidating laundry list of experimentation rules and regulations. My SM fast has begun. I’ve turned off ALL email and application alerts on my laptop, mobile, and tablet. I’m connected to so many platforms I took 15 minutes just to disable notifications! Strangely, I anticipate a productive 72 hours. There’s an event to coordinate, a sermon to write, a cell lesson to teach and I’m halfway through my budgeting and ministry action plans for 2012; this is an appropriate time to fast from SM! All right, it’s 1:40am, barely twenty minutes into my cold turkey and I already feel the urge to…Sleep. This experiment would delight my fiancée most because she always urges me (out of love) to sleep earlier. First benefit felt – more rest. Girlfriend and mother are instantly happier people. 10:00 /// My overnight incoming emails halved! As I commuted to work, I caught up on world, national, and sports news instead of tweets and status updates. The temptation to (conveniently) click on one of my bookmarks or apps is real but bearable. 15:00 /// I find myself wanting to share my candid thoughts (via Twitter and Facebook) and visual observations (via Instagram and Tumblr) but this ban prohibits me. I believe that the need to speak and be heard drives people to be active on SM; to an extent, validation and acknowledgement can be good for the soul and self-esteem. 18:00 /// Several times through the day, I flirted with the idea of using Facebook to contact my youths for work purposes. Perhaps a dearth of SM could prove to be inconvenient if one works with youths? WhatsApp and SMS suddenly become significant again for regular communication. 22:30 /// I desperately want to get onto Facebook now. My fiancée told me that my cousin just posted new pictures of my one day old niece (yes, Jubilee Yim was born yesterday!). I guess SM makes the sharing of the precious moments of life accessible and convenient. This is all Sheryl’s fault! 23:30 /// Contrary to popular belief, the absence of SM didn’t lead me to accomplish exceptionally more work. Yes, I did redeem time by not drifting away in SM, but I didn’t save the world by stopping myself from updating my status, tweeting or posting a photo. So there, nothing mind-blowing, history-making or world-changing happened today. 09:30 /// SM helps me to stalk my youths; I’m subscribed to nearly 150 blogs via Google Reader and frankly, it’s barely enough because I aim to track down every one of the 300 youths in my ministry. I tell them that I stalk them out of love (strange, but true!) so it’s a good thing that this ban lasts just 72 hours. I miss busybody-ing over their lives! When I view their blogs, I read about what’s happening in their lives (and heads) and this gives me an adequate enough preview of how they’re doing as a whole. Of course, nothing beats meeting up but I can’t meet everyone so I try to read about them instead. Either way, their blog content also provides good conversational currency during meet-ups. Furthermore, (I reckon) most youths think it’s cool that their youth pastor reads their blogs. So yes, SM can be immensely useful as a networking tool among youths. 11:30 /// I believe I’m neither addicted to nor in need of SM. The urge to check Facebook or Twitter wanes as the hours pass. I’m halfway through the cold turkey and (unsurprisingly) I haven’t had any withdrawal symptoms. Life goes on. SM, you are overrated! 15:00 /// Half the day has passed, and I must admit that this ban has helped me to be more effective and efficient at work because I’m more focused. It has also increased my concentration and productivity levels. The cause of distraction isn’t the voluntary checks on Facebook or Twitter but the notifications that come in to take your attention away from the task at hand. 17:00 /// Honestly, I think three days is too short a period to determine the effects of SM in our lives. You won’t be able to accomplish anything out-of-the-norm that’s worth a shout out. So what if I can’t share my life online? I’m not losing anything of worth. 23:45 /// It’s been a long day. My day begins at 7.00 am tomorrow and I still have today’s work to complete. The last thing on my mind now is SM. Tonight, I told my fiancée that I’m actually enjoying this cold turkey and I may continue it in some aspects. 06:45 /// 48 hours have passed and it’s enough for my postmortem. For me, SM is a social utility, not a social necessity. You use it, not need it, to make life more convenient and work more effective. But SM will continue to alter the way we communicate with real people. Frankly, anyone who deals with youths (whether a pastor, social worker, parent, teacher or youth leader) should employ SM as a key weapon in their arsenal for reaching youths, but not deploy it diagnostically. It provides only a synopsis, at best. 22:45 /// It’s been such a hectic day that I don’t even have the mental capacity to think about SM. Three days is more than enough to wean off SM and I’m living proof of it. The cold turkey ends in a couple of hours but there’s little or no anticipation. It merely marks the end of this experiment. No confetti necessary. I’ve counseled youths who are capable of spilling their hearts on their blogs and yet incapable of sharing anything beyond the superficial vis-à-vis; they’d rather tweet than talk to people about it. Some of us may frown upon this undesirable behavior, but there is almost nothing we can do to stop this mentality from proliferating. So if we can’t halt SM, we must learn to manage it and ride along with those who have already been institutionalized by it. Like it or loathe it, SM is here to stay and has become (an integral) part of our lives. We should neither shun nor slime it, but subsume it into our daily routine. However, due to its highly addictive nature (that may potentially consume us), we must learn to set perimeters for using it, otherwise it will distract us from and destroy our priorities. I will be the first to admit that SM is important, not because I need to use it, but because it is important to the people I love and care for; hence, it is of value to me. I will use SM as a tool to reach and communicate with this generation of youths for it is their preferred platform of conversation. I’m not reactivating my email notifications. I know this will change my life. I will only spend the excesses of my time on it, capped at thirty minutes per day. Final word: You have nothing to lose except your time. Joey Asher Tan is a 27-year-old stalker in his youth ministry of 300 young people (aka a youth pastor) in Grace Assembly of God Church, Singapore. He attempts to use (and sometimes abuse) social media to remain young. To see what he’s been up to (and how this cold turkey experience has changed him), follow him on Twitter @joeyashertan and check out his blog at joeyasher.com. Now that I’ve led by example, I’m going to challenge my youth ministry to do likewise as I preach it over the pulpit this weekend! Forgive the resolution - it's snapped on my iPhone 4! Posted on November 26, 2011, in Creative Expressions, Extraordinary Mundane, Forever Young, Previews & Reviews, Quote & Unquote, Spontaneous Conversations and tagged Daniel Xu, Eagles VantagePoint, facebook, Google Reader, Instagram, Jubilee Yim, Lee Huiyi, R-AGE, Sheryl Han, Social Media, Tumblr, twitter, WhatsApp, WordPress, Youtube. Bookmark the permalink. Leave a comment.